Recently I had a chance to sit down with the Vice President of Sales for Kartell to discuss some of the new designs available this year. The Dr. 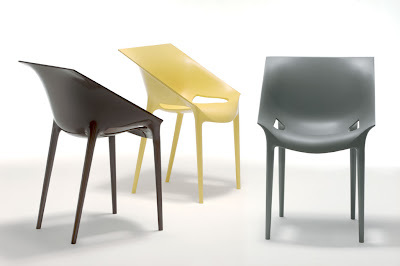 Yes chair by Philippe Starck and Eugeni Quitllet immediately stood out. The story is quite simple. Chair with four legs. But it has a matte finish on the interior and a glossy finish on the outside of the piece. This is done using only one mold. Quite impressive. For those of you familiar with the Dr. No chair seen around town at a variety of eateries such as the South End favorite Joe V's, the Dr. Yes is the next evolutionary leap. The piece offers an aesthetic that works very well in high end spaces. And with the matte interior you're less likely to slip out of the chair after your fourth glass of vino. Manufactured from batch-dyed polypropylene using gas-blowing technology. Like it's predecessor the Dr. No, it can be used in indoor and outdoor installations. Keep an eye on Kartell, they've been doing big things with plastic since the 40's and if this is any indication, the best is yet to come.